Here at Molina Healthcare, our mission is to provide quality healthcare services to financially vulnerable families and individuals covered by government programs. The Corporate Credentialing Department deals with credentialing both individual healthcare practitioners (e.g. doctors) and facilities (e.g. hospitals) in all ten states serviced by Molina. Here is how we’ve used Laserfiche to make a paper-heavy process completely paperless. In order to provide services in the Molina network, a provider (practitioner or facility) must go through the credentialing process, which reviews and verifies a provider’s credentials and history to ensure that provider is able to safely treat the members of the network. This process must be repeated every three years for the provider to remain in the network. The Contracting team, which is responsible for initiating the contracting process and obtaining a credentialing application. The Provider Services team, which is responsible for obtaining information from non-responsive contracted providers. The Actual Office of the Provider, which is responsible for providing clarification and missing information. The credentialing process used to be very cumbersome and lengthy, because the files needed to be passed between departments multiple times—and sometimes shipped back and forth between different states. We have streamlined the process using Laserfiche Workflow. Since a provider has to be credentialed separately in every state, we have a different Laserfiche repository for each state. Each of these repositories has a folder structure corresponding to the different steps in the workflow, which we were able to replicate for each repository. As the application moves through each step of the credentialing process, it moves to a different folder and different person, possibly at a different physical location. The application can move through several possible tracks depending upon the individual scenario (e.g., one application will move through for regular approval, while another might be discontinued mid-process). Below is a general diagram of our core credentialing process. 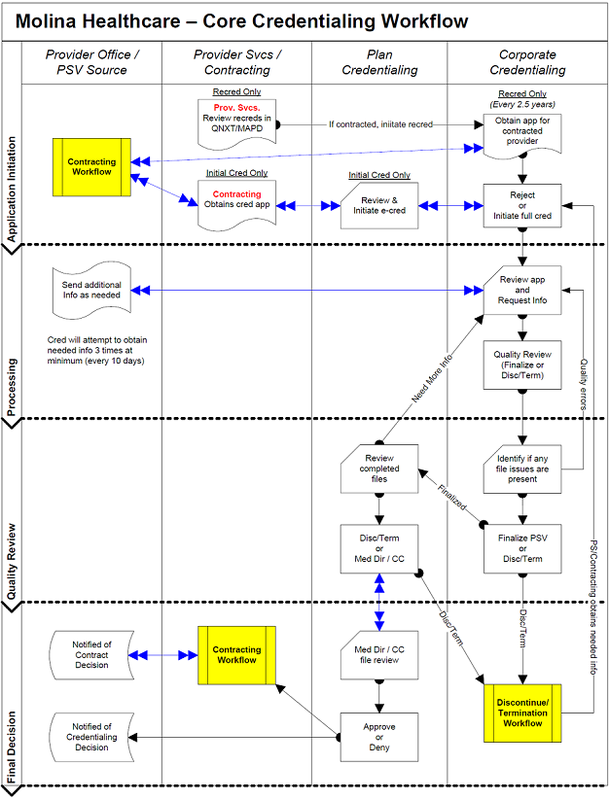 Each yellow box represents a separate master workflow. Several of the different steps in this core credentialing process correspond to a breakout sub-workflow. 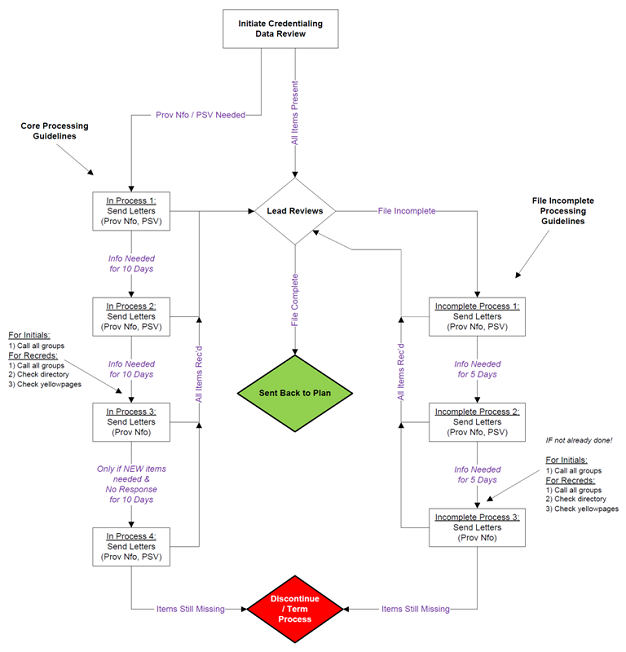 For example, the “Review app and Request Info” step is comprised of the following workflow. As you can see, the documents move seamlessly through the different offices. We no longer have to ship giant boxes of credentialing applications all around the country. Instead, we simply transfer files in a few seconds with a few mouse clicks. Approximately 60% of all applications come from the Council for Affordable Quality Healthcare (CAQH) database. A provider submits one application to CAQH and can use it to apply to multiple health insurance carriers in multiple states. After downloading such applications from CAQH, we use Laserfiche Snapshot and locally developed software to batch import them into Laserfiche. 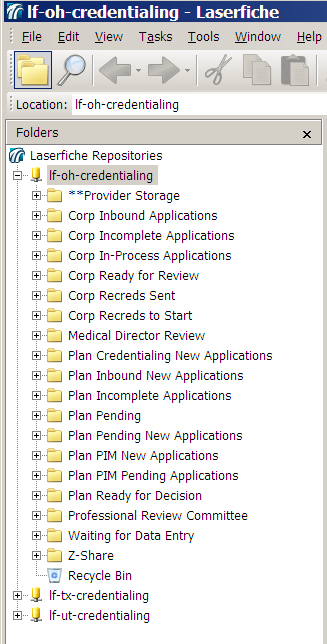 We also use the XML version of the data to upload directly into our credentialing database when possible. Approximately 40% of applications are still hand written. These applications have to be scanned into Laserfiche and data entered manually into our credentialing database. During this stage, we make sure that the applications are complete and request additional information if necessary. We also verify multiple credentials (e.g., medical license, board certification, etc.) 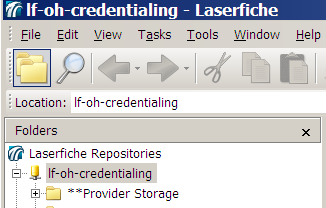 and use Laserfiche Snapshot to import them into the credentials file. If the provider doesn’t respond to our requests for missing or conflicting information after three attempts, the application is discontinued, at which point our networking units (Contracting or Provider Services) may decide to pursue the information. At any point during the quality review process, additional information may be identified that will need to be requested or the application may be discontinued. During this stage, provider files are reviewed by a peer review committee (for files with issues) or a medical director (for clean files) for a final decision. Providers are then notified whether their application was approved, denied or discontinued. If the application was discontinued, a provider can supply the missing information and resubmit her application. It will then have to go through the entire process all over again. If a provider’s contract was terminated because the provider failed to submit the required missing documentation, s/he must begin the contracting process again and be treated like an initial credentialing applicant. 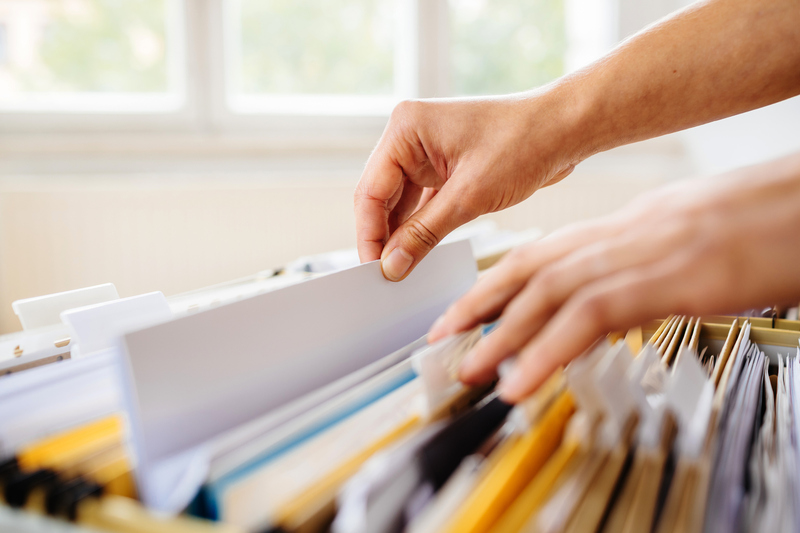 Once the application approval and review is completed, the application moves to the “**Provider Storage” folder in the Laserfiche repository to be retained for up to 40 years after a contract termination, depending on the retention law in each state. Decrease our average processing time per file from 53 days to 35 days. Decrease our cost per file from $180 to $108, saving us a total of $750,000 in the first year. Increase our average quality scores from 83% to 92%. Improve the speed of credentialing in new states that we service. Increase the general volume capacity when application volume fluctuates. Improve our confidence in retrieval of documentation for audits. The core of paperless credentialing is business process automation – learn how to diagram, optimize and automate your existing business processes with the free guide!